Men wear suits to spruce up their style and connect with others easily. Branded suits transform the looks of the wearer and make him powerful in the society. Executives will look bright and smart when they wear armani suits that are shown here. Armani suits will hide the body thoroughly and enrich wearer's status. Office goers will get that authoritative and confident looks when they wear armani mens suits which are tailored perfectly. 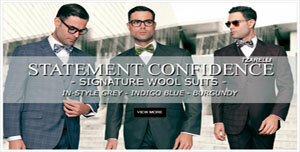 Buy one or many from armani suits sale and wear it during upcoming event. Politicians and socially elite men will look penchant when they wear black armani suit. Individuals who wear black Armani suit should complement it with branded white shirt, long green ties, black leather shoes and other luxurious accessories. Adult men who care about their appearance should wear armani blue suit. Sky blue branded color shirt, stripped ties, blue trousers, white socks, black leather shoes and other stylish accessories will go well with these types of luxury suits. Armani suits are becoming preferred choice for celebrities, politicians, industrialists and other affluent people. Elite men consider Armani suits as status symbol and wear them during important meetings and conferences. Italian businessmen first choice is Armani suits since they feel that these attires bring good luck. People who maintain high stature will look beyond recognition when they wear these wonderful suits which come from the house of branded manufacturer. Film stars, directors and hosts love wearing Armani suits since they feel that these clothing add more glamor and colors in their life. Groomsmen who are readying for marriage will look smart and suave when they wear double breasted black suits along with branded white shirt, bow-tie and armani tuxedo shoes. They can add more elegance and captivate others hearts when they wear vest above the inner shirt. When it comes to armani suits there are various options for the groomsmen. These suits which are famous among groomsmen come in various colors like black, blue, red and green. Armani suits are considered as excellent wardrobe collection and millions of boys showcase interest in wearing these stylish clothing during wedding and other important functions. Flamboyant personalities will get that arresting looks when they wear black suit and pan. Dynamic men who have that cowboy look should wear blue wedding outfit and complement it with sunglasses, light blue shirt, long black ties and other accessories. Executives can communicate their presence in a wonderful manner when they wear armani suits. These suits which are stitched elegantly will add more warmth during winter and chiller climates. Men can wear sweaters and woolen clothing under these stylish suits and weather the cold climates easily. Men who are ambitious to look better should choose these high quality and branded suits which are tailored with rich fabrics and materials. They will always stay in the limelight and get that red carpet reception when they these suits which are tailored immaculately. Tall guys will look trim and fit when they wear armani suits.